Republicans’ favorite television news host is Fox News’ Tucker Carlson, with a net favorability of 31 percentage points, while Shepard Smith’s net favorability rings in at 2 points. In contrast, Democrats’ favorite hosts are from ABC, CNN and NBC. Among adults aged 25-49, Roberts is most-loved news host, with 53 percent holding a favorable view of her, while 14 percent have an unfavorable view. 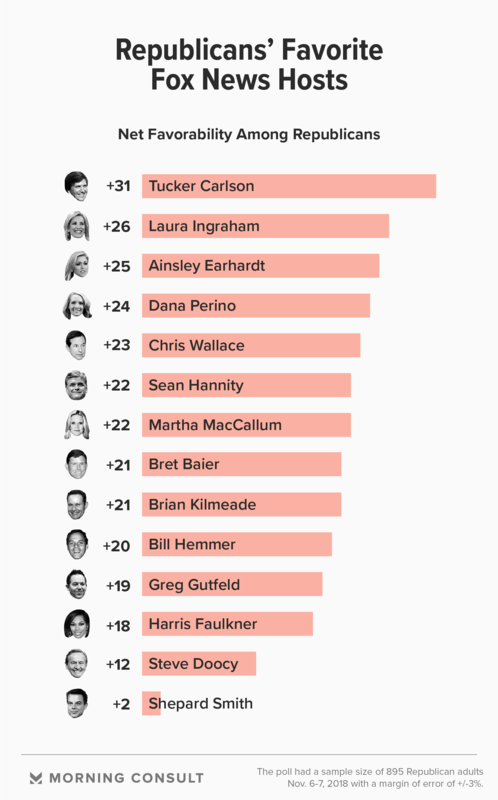 Tucker Carlson, Laura Ingraham and Ainsley Earhardt are Republicans’ favorite television hosts, with Fox News personalities making up the group’s top 13 most-loved hosts, according to a Morning Consult/Hollywood Reporter survey that looked at Americans’ trust in well-known anchors on network and cable TV. Shepard Smith, who made headlines last month for downplaying his own network’s coverage of the immigrant caravan in Mexico, is the least-loved Fox News personality among members of the GOP, according to the survey, which polled 2,202 U.S. adults from Nov. 6-7. Twenty-three percent of Republicans have a favorable view of the “Shepard Smith Reporting” host, while 21 percent perceive him unfavorably. In the days leading up to the midterm elections, Fox News anchors, including Carlson and Sean Hannity, dedicated a notable amount of airtime to warning viewers about a caravan of Central Americans allegedly heading north toward the U.S.-Mexico border. A Fast Company analysis of Fox News transcripts on LexisNexis shows the network used the word “caravan” 86 times on air the day before the election. By contrast, Smith told viewers of his daytime show that there was little evidence for fear. “There is no invasion. No one’s coming to get you. There’s nothing at all to worry about,” Smith said on his show Oct. 29, after implying news of the caravan was timed to coincide with the midterm elections. Ahead of the midterms, more voters trusted Republicans over Democrats on the issue of national security, according to Morning Consult/Politico tracking data. Smith has often taken a contrary position to others on the network: In November 2017 he debunked the theory that former Secretary of State Hillary Clinton greenlighted a uranium deal that benefited her foundation, a storyline his colleagues were reporting. In contrast, Carlson enjoys a 31-percentage-point net favorability (42 percent favorable rating, 11 percent unfavorable) among Republicans, who largely trust Fox News above other news outlets, according to a July 26-30 Morning Consult poll. “Tucker Carlson Tonight,” is the second-most watched show on the network, attracting 3.2 million viewers last month, Fox News said, citing Nielsen media ratings. “Shepard Smith Reporting” attracted an audience of 1.7 million viewers. Similar shares of Republicans said they had not heard of Tucker (32 percent) and Smith (36 percent). The survey has a margin of error of 2 percentage points. “Hannity” was the most-watched cable news program for the seventh consecutive month in October, Fox said. And while Republicans’ top 13 most-loved news figures are all from Fox News, Democrats’ top picks are a bit more varied: ABC’s Robin Roberts (+61), CNN’s Anderson Cooper (+59) and NBC’s Lester Holt (+55) have the highest net favorability among Democrats. Roberts has the highest favorability for a news personality among all adults ages 25-49, a key demographic for television. Fifty-three percent have a favorable view of her, while 14 percent have an unfavorable view. When it comes to trust, a larger share of the public perceives network news hosts as trustworthy than their counterparts on cable TV. Lester Holt, who replaced Williams as NBC’s evening news host, is the most-trusted news figure on television. Forty-six percent of Democrats and 22 percent of Republicans say they have “a lot” of trust in him, a higher share than the Republicans who say the same about Fox News’ Smith (14 percent). Anderson Cooper, host of CNN’s Anderson Cooper 360°, is the most polarizing news figure, appearing on both the most-trusted and least-trusted lists: Twenty-nine percent say they trust Cooper “a lot,” while 19 percent say they don’t trust him at all. That’s largely driven by political divides: Forty-six percent of Democrats say they have a lot of trust in Cooper, while 32 percent of Republicans say they have no trust in him at all. Correction: A previous version of the graphic listing most-trusted hosts misidentified the network logos for Andrea Mitchell and Brian Williams.